As my garden yield so many fresh green chilies in different shapes (fat, short, long chilies), I couldn't resist to make some special dish with these. 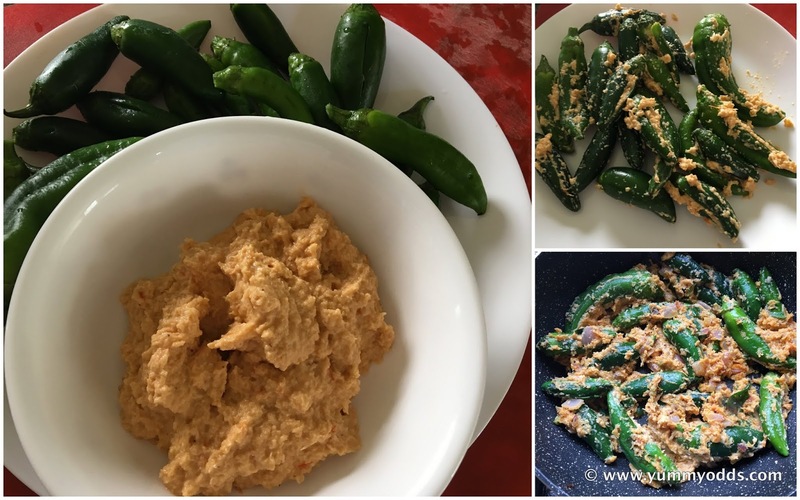 I have already tried popular Hyderabad recipe Mirchi ka Salan before, but this time i am in search of new flavor and variation for this Stuffed Green Chili recipe. I have browsed several recipes and regional styles, and finally settled on this version. Sesame and Coconut stuffing in this recipe gives such a creamy taste to this dish, I bet you wouldn't stop eating with one stuffed green chili. Hubby also gave thumbs up for this dish, now i can easily put those fresh organic home grown chilies for good use with this simple recipe. Here is the recipe for you, njoy! Dry roast sesame seeds and coconut powder for 1 min and keep them aside. Grind these in a small mixie jar or nut grinder to make it into fine powder. Saute chopped onion and tomato in a pan for 3 min. Let it cool and grind it in small mixie jar to paste. To this add sesame and coconut powder and grind one more time until every thing is mixed together becomes a thick paste. To this paste add salt, coriander powder and green chili powder mix well. Wash Green chili and tap them with paper towel to dry. Carefully make a slit in the middle and tap it down facing the slit down, to remove all the seeds. Repeat this for all the green chili and keep them aside in a wide plate. Heat non-stick wide pan and add oil to it. Once the oil is hot add ginger garlic paste. Let it saute for 2 min, until it separated from oil. Add remaining sesame & coconut paste to the pan and fry for 2 min. Now add stuffed green chilies carefully to the pan and cover them with onion paste. Close the lid and simmer for 5 min allowing green chili to cook and become tender. Add 1/3 cup of water to the pan and close the lid, simmer for 5 more min. Open lid mix everything well gently and taste and adjust the seasonings (esp salt). Now leave the lid open and cook on high flame for another 5 min or curry becomes together like thick gravy. Switch off the stove and transfer to serving bowl. Enjoy this spicy stuffed green chili with warm white rice.